Moore's prediction proved accurate for several decades and has been used in the semiconductor industry to guide long-term planning and to set targets for research and development. Advancements in digital electronics are strongly linked to Moore's law: quality-adjusted microprocessor prices, memory capacity, sensors and even the number and size of pixels in digital cameras. 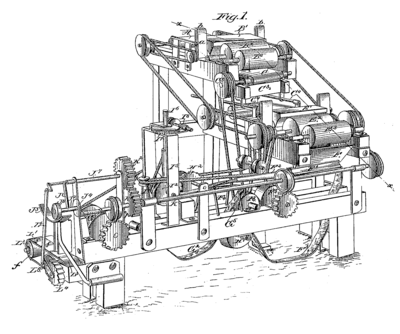 Digital electronics has contributed to world economic growth in the late twentieth and early twenty-first centuries. Resistive random-access memory (ReRAM or RRAM) is a type of non-volatile (NV) random-access (RAM) computer memory that works by changing the resistance across a dielectric solid-state material, often referred to as a memristor. This technology bears some similarities to conductive-bridging RAM (CBRAM), and phase-change memory (PCM). A space elevator is conceived as a cable fixed to the equator and reaching into space. A counterweight at the upper end keeps the center of mass well above geostationary orbit level. 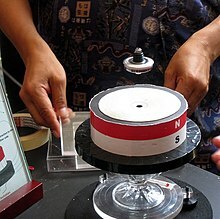 This produces enough upward centrifugal force from Earth's rotation to fully counter the downward gravity, keeping the cable upright and taut. Climbers carry cargo up and down the cable. A space elevator is a proposed type of planet-to-space transportation system. 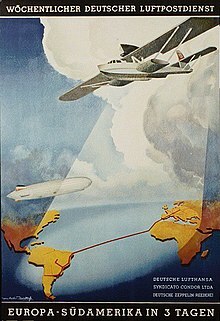 The main component would be a cable (also called a tether) anchored to the surface and extending into space. 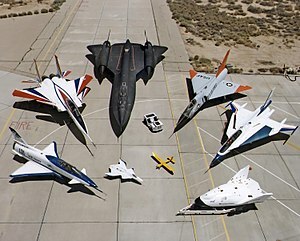 The design would permit vehicles to travel along the cable from a planetary surface, such as the Earth's, directly into space or orbit, without the use of large rockets. An Earth-based space elevator would consist of a cable with one end attached to the surface near the equator and the other end in space beyond geostationary orbit (35,786 km altitude). The competing forces of gravity, which is stronger at the lower end, and the outward/upward centrifugal force, which is stronger at the upper end, would result in the cable being held up, under tension, and stationary over a single position on Earth. With the tether deployed, climbers could repeatedly climb the tether to space by mechanical means, releasing their cargo to orbit. Climbers could also descend the tether to return cargo to the surface from orbit. 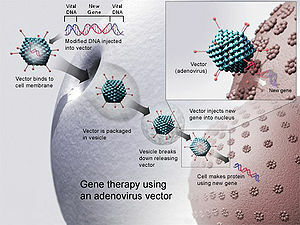 In the medicine field gene therapy (also called human gene transfer) is the therapeutic delivery of nucleic acid into a patient's cells as a drug to treat disease. The first attempt at modifying human DNA was performed in 1980 by Martin Cline, but the first successful nuclear gene transfer in humans, approved by the National Institutes of Health, was performed in May 1989. The first therapeutic use of gene transfer as well as the first direct insertion of human DNA into the nuclear genome was performed by French Anderson in a trial starting in September 1990. 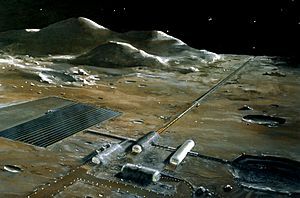 Artist's conception of a mass driver on the Moon. 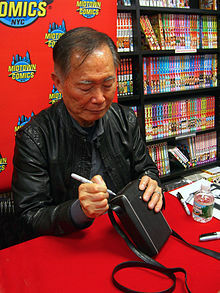 Actor George Takei autographing a tricorder at Midtown Comics in Manhattan. In the science-fictional Star Trek universe, a tricorder is a multifunction hand-held device used for sensor (environment) scanning, data analysis, and recording data. 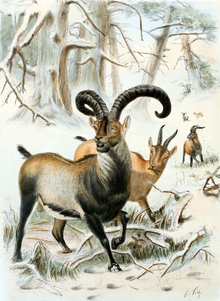 The Pyrenean ibex, or bucardo, is the first animal to have survived de-extinction past birth. De-extinction, or resurrection biology, or species revivalism is the process of creating an organism, which is either a member of, or resembles an extinct species, or breeding population of such organisms. Cloning is the most widely proposed method, although selective breeding has also been proposed. Similar techniques have been applied to endangered species. Dennis Gabor CBE FRS (/ˈɡɑːbɔːr/); Hungarian: Gábor Dénes; 5 June 1900 – 9 February 1979) was a Hungarian-British electrical engineer and physicist, most notable for inventing holography, for which he later received the 1971 Nobel Prize in Physics. Bernard D.H. Tellegen (24 June 1900 – 30 August 1990) was a Dutch electrical engineer and inventor of the pentode and the gyrator. He is also known for a theorem in circuit theory, Tellegen's theorem. Aaron Douglas O'Connell (born March 5, 1981, in Allentown, Pennsylvania) is an American experimental quantum physicist. While working under Andrew N. Cleland and John M. Martinis at the University of California, Santa Barbara, he created the world's first quantum machine. In particular, he was able to transfer the quantum state of a superconducting quantum bit, a device used in quantum computation, to the motional state of a macroscopic mechanical resonator. 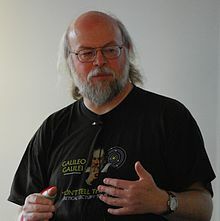 His measurements of the quantum machine constitute the first direct observations of quantized behavior in the motion of a visible object and led the journal Science to honor his work as the "Breakthrough of the Year" of 2010. 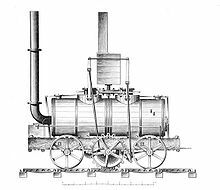 John Blenkinsop (1783 – 22 January 1831) was an English mining engineer and an inventor of steam locomotives, who designed the first practical railway locomotive. 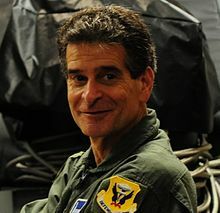 Dean L. Kamen (born April 5, 1951) is an American engineer, inventor, and businessman. He is known for his invention of the Segway, as well as founding FIRST with Woodie Flowers. ChaCha was a human-guided search engine. 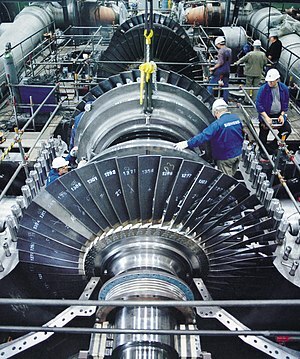 It provided free, real-time answers to any question, through its website, or by using one of the company's mobile apps. Charles Goodyear (December 29, 1800 – July 1, 1860) was an American self-taught chemist and manufacturing engineer who developed vulcanized rubber, for which he received patent number 3633 from the United States Patent Office on June 15, 1844. Gyula Takátsy (1914–1980), was a Hungarian medical doctor, microbiologist and inventor. 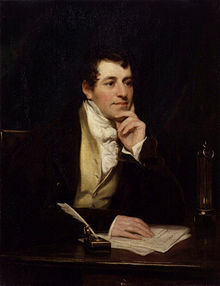 Sir Humphry Davy, 1st Baronet PRS MRIA FGS FRS (17 December 1778 – 29 May 1829) was a Cornish chemist and inventor, who is best remembered today for isolating, using electricity, a series of elements for the first time: potassium and sodium in 1807 and calcium, strontium, barium, magnesium and boron the following year, as well as discovering the elemental nature of chlorine and iodine. He also studied the forces involved in these separations, inventing the new field of electrochemistry. 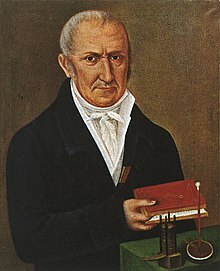 In 1799 Davy experimented with nitrous oxide and was astonished at how it made him laugh, so he nicknamed it "laughing gas", and wrote about its potential anaesthetic properties in relieving pain during surgery. Berzelius called Davy's 1806 Bakerian Lecture On Some Chemical Agencies of Electricity "one of the best memoirs which has ever enriched the theory of chemistry."